The Stormont House Agreement is now history. It joins the long list of documents gathering dust in the archives like the 1995 Frameworks Document, large chunks of the 2001 Weston Park Agreement and the 2010 Hillsborough Agreement. Stormont House isn’t just history because it’s not going to be implemented. It’s because events have moved quickly to make a lot of it irrelevant even if it were implemented. The major emphasis the British government insisted on was clinching welfare cuts. All the agonising that has gone on for the past six months has been about cuts that the British coalition government brought in in 2012-3 and Sinn Féin refused to implement. Now, even if Sinn Féin were to agree the deal struck last December, it wouldn’t look at the cuts coming down the pipeline after the Chancellor’s budget statement on July 8. Already a further £38 million has been whacked off departments here. There’s nothing like enough money to pay for the huge redundancy scheme to reduce the North’s bloated civil service. Stormont will now have to continue to employ them even though they couldn’t afford to before Osborne’s axe. In short there’s no point in Sinn Féin agreeing to the package they rejected in February because the next cuts will nullify the benefits they thought they’d gained in December. 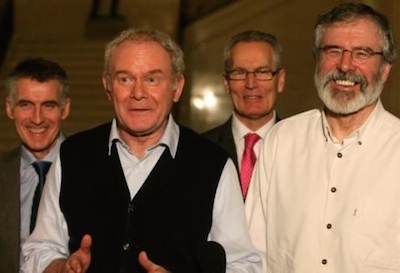 Those sections in the Stormont House Agreement deal with history – 2013 – not the future. What good would they be if, as speculated for example, George Osborne cuts tax credits? How could Sinn Féin discriminate between low-paid working families likely to lose between £850 and £1,400 a year and unemployed families? And that’s for starters. Where will the money come from to pay for 12 departments when Osborne is whacking lumps out of Defence, Justice and the Home Office? However, all this emphasis on welfare cuts misses the fundamentally flawed aspect of the Stormont House Agreement. It’s this. The Northern parties and the Irish government supinely agreed merely to tack on after welfare matters critically important for The North which have been parked since 1998: flags, Orange marches and the past. The first 14 paragraphs of Stormont House deal with ‘Finance and Welfare Reform’. The following 61 deal in detail with the matters which have dominated the streets here since 2012 and the lives of people injured in the Troubles for decades past. The participants allowed our clueless proconsul to put the cart before the horse last September. The discussions on flags, marches and the past should have been the priority because our proconsul failed abjectly in 2013 to confront the chaos caused by the flag protests and Orange marches. She hung Richard Haass out to dry at the end of the year and had to return to square one last September, finally involving the Irish government in full scale talks she should have convened early in 2013. As a result of tying together welfare cuts, budgetary matters and all the other contentious issues we are now at the stage where she has accomplished a big fat zero. There were to be arrangements for setting up a funded opposition at Stormont by March: nothing. There was to be a commission on Flags, Identity and Culture appointed by June: nothing. There were to be proposals on parades by June: nothing. There was to be legislation establishing a Historical Investigations Unit: nothing. Why none of this has happened is down to our proconsul while the Irish government stood idly by. There is no compelling reason other than our proconsul’s insistence on her government’s anti-state ideology, its deficit fetishism, why the elements of the Stormont House Agreement other than welfare cuts can’t be implemented or at least proposals made about them. Instead we face into another marching season beginning with threats from the Orange Order at Twaddell refugee camp at the weekend. Thanks to our proconsul’s political failure she’s obviously prepared to waste several million pounds more on public order and police overtime rather than prioritise the health and welfare of people injured and traumatised over the last generation. You might notice that, unlike flags and marches, there’s no timeline in Stormont House for dealing with victims.